Turbidity is a measure of water’s lack of clarity and is an important indicator of water quality. Water with high turbidity is cloudy, while water with low turbidity is clear. The cloudiness is produced by light reflecting off particles in the water; therefore, the more particles in the water, the higher the turbidity. Note: Vernier products are designed for educational use. Our products are not designed nor are they recommended for any industrial, medical, or commercial process such as life support, patient diagnosis, control of a manufacturing process, or industrial testing of any kind. The Turbidity Sensor may require a compatible interface and software. Choose a platform below to see compatible interface and software options. The Turbidity Sensor is fully supported with LabQuest 2 (version 2.8.5), a standalone data logger with built-in graphing and analysis software. Connect the sensor to the interface (LabQuest Mini, LabQuest 2, etc.). Start the appropriate data-collection software (Logger Pro, Logger Lite, LabQuest App) if not already running, and choose New from File menu. Warm up the sensor by connecting it to the software for at least five minutes prior to use. Gently invert the sample water to mix in any particles that may have settled to the bottom. Important: Do not shake the sample. Shaking will introduce tiny air bubbles that will affect turbidity. Empty the distilled water from the cuvette and rinse it with sample water. Fill the cuvette to the top of the line with sample water. Screw the lid on the cuvette. Wipe the outside with a soft, lint-free cloth or tissue. Hold the cuvette by the lid and place it into the Turbidity Sensor. Make sure the marks are aligned. Close the lid. Monitor the turbidity value. Note: Particles in the water will settle over time and show a slow downward drift in turbidity readings; therefore, take your readings soon after placing the cuvette in the sensor. Colleen McDaniel introduces the Vernier Turbidity Sensor. Use the Turbidity Sensor to measure the turbidity of freshwater or saltwater samples and determine water quality, or use the Turbidity Sensor to monitor precipitate formation or algae and yeast populations in chemistry and biology classes. Enter the calibration routine for your data-collection program. First Calibration Point: Obtain the cuvette containing the Turbidity Standard (100 NTU) and gently invert it four times to mix in any particles that may have settled to the bottom. Important: Do not shake the standard. Shaking will introduce tiny air bubbles that will affect turbidity readings. Wipe the outside of the cuvette with a soft, lint-free cloth or tissue. Holding the standard by the lid, place it in the Turbidity Sensor. Align the mark on the cuvette with the mark on the Turbidity Sensor. Important: These marks must be aligned whenever a reading is taken. Enter 100 as the value in NTU. Second Calibration point: Prepare a blank by rinsing the empty cuvette with distilled water, then filling it to the top of the line with distilled water. Important: The bottom of the meniscus should be at the top of the line for every measurement throughout this test. This volume level is critical to obtain correct turbidity values. Holding the cuvette by the lid, place it into the slot of the Turbidity Sensor. Makec sure that the marks are aligned. Close the lid. Enter 0 as the value in NTU. You are now ready to collect turbidity data. Store the calibration by following the directions under the Storage tab (Logger Pro and LabQuest only). You are now ready to collect turbidity data. Specific instructions for each software platform can be found here:. When you have finished using the Turbidity Sensor, simply rinse the sample cuvette with distilled water. It is important to take good care of your cuvette and the Turbidity Standard. Their integrity is essential for accurate turbidity measurements. Do not wrap the cable tightly around the sensor for storage. Repeatedly doing so can irreparably damage the wires and is not covered under warranty. Infrared light is directed at a cuvette containing the sample water. This light is scattered in all directions off the particles in the water. A detector, consisting of a photodiode, is placed at a 90° angle to the light source. The amount of light being scattered directly into the detector is measured in volts and translated into turbidity units. This style of turbidity sensor is called a nephelometer. A standard is used to calibrate the Turbidity Sensor in units of NTU, Nephelometric Turbidity Units. This sensor is equipped with circuitry that supports auto-ID. When used with LabQuest 2, LabQuest, LabQuest Mini, LabPro, Go! Link, SensorDAQ, EasyLink, TI-Nspire™ Lab Cradle, or CBL 2™, the data-collection software identifies the sensor and uses pre-defined parameters to configure an experiment appropriate to the recognized sensor. 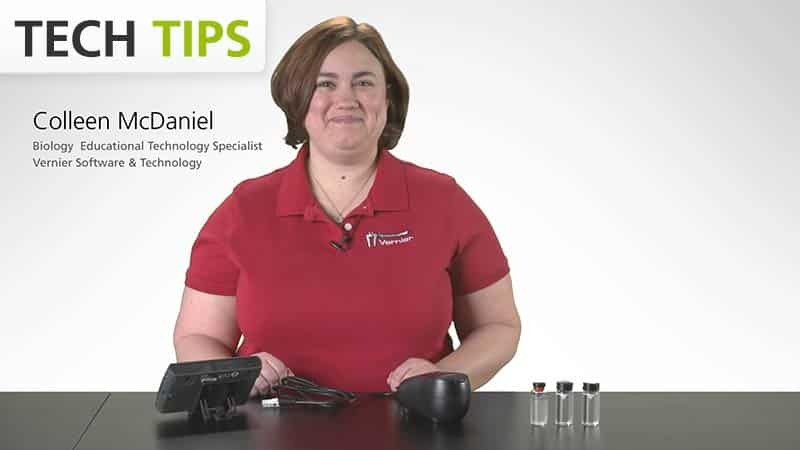 If you have watched the related product video(s), followed the troubleshooting steps, and are still having trouble with your Turbidity Sensor, contact Vernier Technical Support at support@vernier.com or call 888-837-6437. Support specialists will work with you to determine if the unit needs to be sent in for repair. At that time, a Return Merchandise Authorization (RMA) number will be issued and instructions will be communicated on how to return the unit for repair. Vernier warrants this product to be free from defects in materials and workmanship for a period of five years from the date of shipment to the customer. This warranty does not cover damage to the product caused by abuse or improper use. This warranty covers educational institutions only. When disposing of this electronic product, do not treat it as household waste. Its disposal is subject to regulations that vary by country and region. This item should be given to an applicable collection point for the recycling of electrical and electronic equipment. By ensuring that this product is disposed of correctly, you help prevent potential negative consequences on human health or on the environment. The recycling of materials will help to conserve natural resources. For more detailed information about recycling this product, contact your local city office or your disposal service. The symbol, shown here, indicates that this product must not be disposed of in a standard waste container.